Select the Start menu in the bottom left hand corner of your screen. Select the All Programs folder and then Accessories. 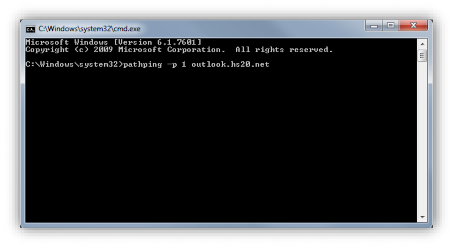 Select the Command Prompt option. You should see a window similar to that shown below. Press Enter to start the test. Our support team require the full results of this test so please wait until you see a line which states "Trace complete". At this point please ensure the window is maximised and take a screenshot of the results. Then send them to support@cobweb.com with your incident reference number in the subject line. If you are unsure how to take a screenshot, please refer to the last page of this guide. 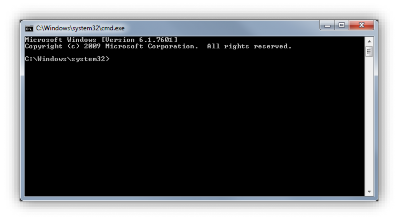 Follow steps 1-4 above to reopen the Command Prompt. Here is an example of how the command should look. Press Enter to start the test. This can take a few minutes. Please wait for "Trace complete". Please take a screenshot of the results and send them to support@cobweb.com with your incident reference number in the subject line. Our support team require the full results of the test for analysis. Once completed you will see a line stating Trace complete. Right click on the Outlook symbol in the System Tray (Bottom-right of your screen, next to the time and date) whilst holding the Ctrl key. Select the Connection Status... option as indicated below. 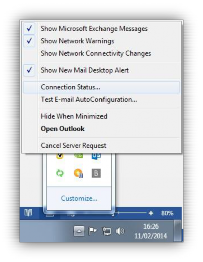 Once this has been selected the Outlook Connection Status window will open. The required fields are shown below, please expand and make this window as large as possible before taking a screenshot. Then send the screenshot to support@cobweb.com with your incident reference number in the subject line. 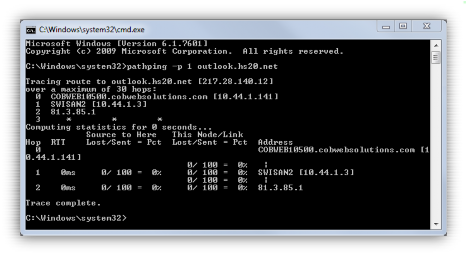 Your public facing IP address can be found by clicking here. Please provide us with the name of the company who supplies your internet connection, along with your public facing IP address. Send this information to support@cobweb.com with your incident reference number in the subject line. Screenshots of the results for the above tests can be taken in two different ways. Please find details for each process below. The print screen feature allows you to copy and paste an image of your entire desktop. To do this you will need to press the Print Scrn button on your keyboard which can usually be found to the right of the F12 key, though this may vary. Once this has been done you can paste the image into a new email or blank word document by pressing Ctrl + V on your keyboard. 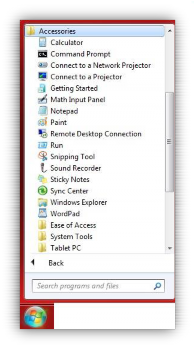 Snipping Tool and 'snip' the relevant part of your screen.